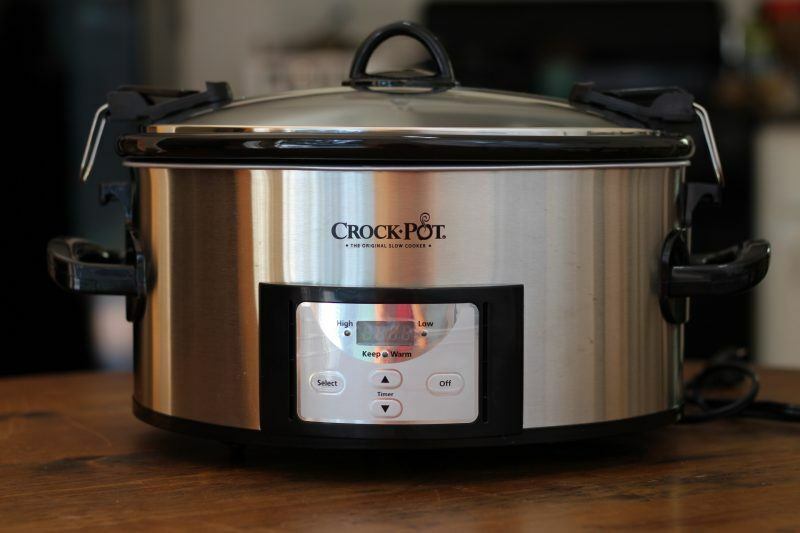 Comparing Crock-Pot Smart Pot Slow Cooker Models . One of the more unusual things about the Smart Pot range is the programming panel, which you can see with this model. This style isn’t present for all Smart Pot slow cookers but it is common. The panel is unexpected because it doesn’t allow you to directly set a time. Instead, you choose 4,6,8 or 10 hours. Additionally, the 4- and 6-hour options are for high temperature only, while the 8- and 10-hour options are for low. Now, I have mixed feelings about this. For the most part, the settings aren’t going to be an issue. Slow cooking isn’t an especially precise manner of cooking, so not being able to choose more exact times won’t matter for most recipes. Plus, the settings are still more than you’d get on a manual slow cooker, so you’re getting a good deal for the price. However, if you plan to cook more unusual or specialized meals (like baking in a slow cooker, for example), then it’s worth looking at a programmable slow cooker that offers more options. As is often the case, this second model is a recolor of the first. So, it still comes with the same strengths and limitations. With that in mind, you can simply pick between the two based on the color you prefer. At 5 quarts, this slow cooker is a little larger than the previous models, while still having the same general style and design. However, one interesting thing about it is the shape. The other models in this list are all oval, which tends to be more common overall. In contrast, this model is round. For many meals, the shape of the slow cooker isn’t likely to make a huge difference. However, a round slow cooker can be appealing because it is often easier to fit in a kitchen. 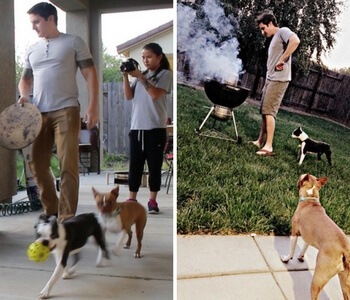 The shape will also be relevant if you plan to cook large cuts of meat from time-to-time. For example, it’s fairly easy to fit a roast chicken in an oval slow cooker but difficult to do so in a round one. In many ways, this model is similar to the previous one, especially as the size and shape are the same. The biggest difference comes from the control panel, which is unusual in this particular slow cooker. However, even though the style is different, the control panel does still have the same functions and settings to most of the other slow cookers in this list. In particular, there is the same ability to cook on high for 4 or 6 hours, or to cook on low for 8 or 10 hours. This model is interesting because it can be considered part of the Smart Pot range, along with part of Crock-Pot’s Cook and Carry range. The Cook and Carry aspect accounts for the clips on the top, which makes the slow cooker easier to move from one location to another. Additionally, the slow cooker has a programmable aspect, which gives you some control over cooking time. However, this particular design doesn’t give you the same flexibility as many other programmable slow cookers. In particular, you can only pick a time in 2-hour increments and the times are tied to temperature. So, you can cook on high for 4 hours or 6 hours, or on low for 8 hours or 10 hours. The design is still effective for most slow cooker recipes out there. However, if you’re wanting to make something that is a little unusual or specialized then you may find that the settings don’t give you everything that you need. This slow cooker doesn’t have the same panel as the previous ones. Instead, the model is more typical for a programmable slow cooker, offering you the ability to set the temperature and time based on your needs. This makes it more flexible and powerful overall. Additionally, the model is one that crosses ranges. So, it can be considered a Smart Pot because it is programmable but it is also part of the Cook and Carry range. That range has the clips that you see in the image, which help to keep the lid on. The end result is that this slow cooker has a range of advantages, while also being reasonable in terms of price. 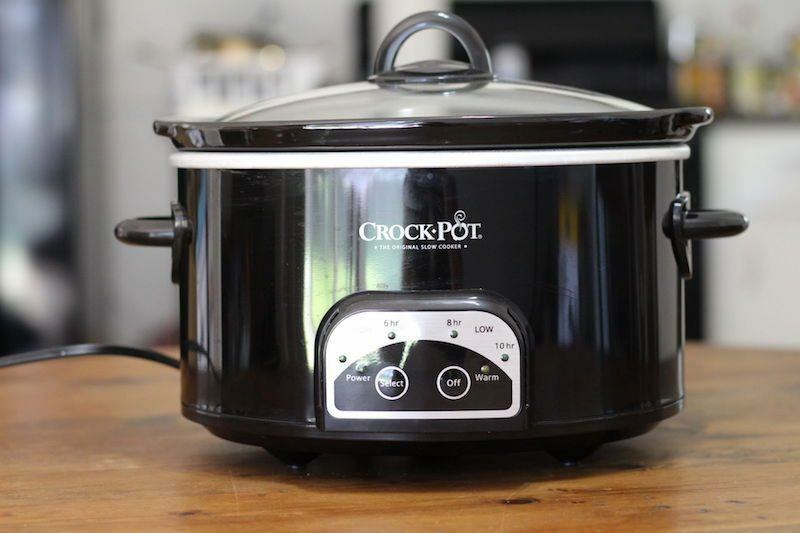 Certainly, the model is not the cheapest slow cooker in the market but it’s worth paying a little more to get something that is truly going to perform well. Once again, this model is a recolor of the previous one. Both versions tend to receive good reviews and collectively have an average of 4.2 stars on Amazon. In fact, some reviewers even comment that these models are better than the pricey options that are out there. This model goes back to the previous style, where you basically have four options for time/temperature combinations. In this case though, the slow cooker is larger. In fact, 7 quarts is a fairly impressive size overall and is a size that bigger families will often choose. Although the model doesn’t fare so well in reviews, that may be mostly due to the fact that people tend to buy the smaller versions. In practice, this slow cooker is likely to perform in a similar way to the others on this list. Not satisfied with these? Don't forget the Hamilton Beach Stay or Go models, or the Set ‘n Forget lineup from the same company.